Electronic identification upgrades your flyable parts to smartness. Air transport is a complex business. Airports, airlines, aircraft manufacturers, parts suppliers and maintenance organizations must coordinate their activities to make operations safe, efficient and profitable. FLYtag® is an approved electronic identification system that improves aircraft turnover and minimizes operational disturbances. The Air Transport Association (ATA), the trade association for airlines, expanded guidelines for component parts tracking in ATA Spec 2000. It implies recommendations for automating part traceability using RFID in Chapter 9.5. 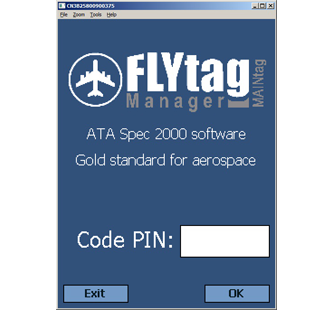 FLYtag® manager PC incorporates the latest ATA Spec 2000 Chap 9.5 standards including and Dual/Single (1 Kbit / 2 Kbits) and Multi record (8 Kbytes to 32 Kbytes and up). It includes the birth record ATA bank as well as the EPC bank as defined in TDS 1.11. With FLYtag® manager PC, suppliers meet all manufacturer RFID part marking requirements (Airbus, Boeing, Eurocopter, etc.) for tracing flyable components across their full lifecycle.